When I was new to making my own board games I had a lot of questions about artwork and where to find board game artists. Today’s guest gave me a great rundown on where artists go to find new gigs. And where better to look than the websites that board game artists like to advertise? Jamie Noble Frier also gave me some great feedback on how I can better communicate with board game artists. This will greatly help board game artists like Jamie recreate the world I have in the back of my head. But first, let’s find out a little bit about today’s guest, our second board game artist. Now let’s jump into the interview with the Noble Artist! 1. How long have you been creating digital art? Hey thanks for having me Calvin. I first encountered Adobe Photoshop when I was at art college back in 2002. I was doing a photography module and I made a mash a friend dressed in a toga and a bull to create a minotaur. It probably looked awful, but it was exciting that I could create fantasy images digitally (you might see that genre feature a little bit in my portfolio). I never even considered at the time that you could paint with it, I always thought it was just for photo-editing. Now I pretty much only use Photoshop for painting. 2. What are some of the games you have worked on? A card game of the popular PC game Magicka. 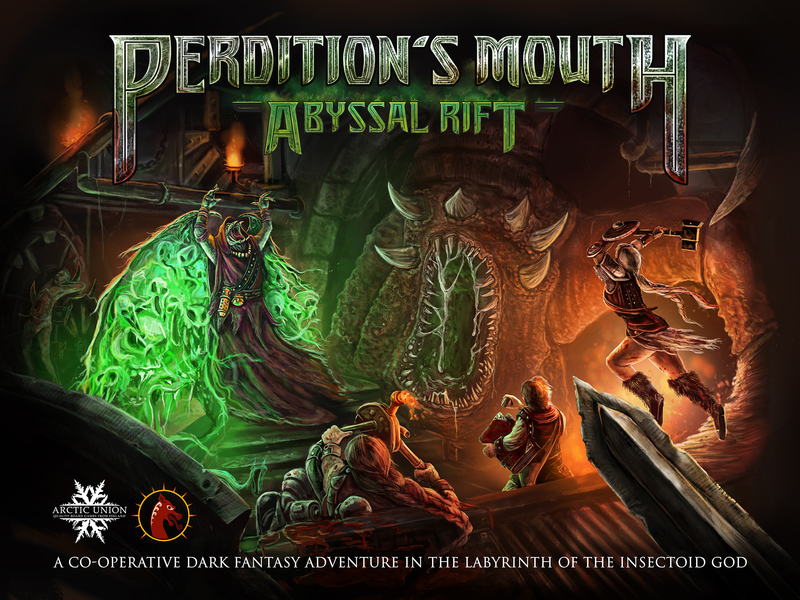 An awesome ‘dungeon crawler with a difference’ called Perdition’s Mouth. A game that was successfully Kickstarted called Smiths of Winterforge. Several big strategy games for Knightworks Games called Forged in Steel, Hands in the Sea and their upcoming title Clockwork Island. Plus lots of other titles that are in the works. 3. Which piece of your artwork are you most proud of? Haha, great question! It changes daily. I’d give you a new one each week if I could get a regular slot. Usually my favorite piece is the one I’m working on, because as soon as I look back on my work I see all the things I wanted to do better, so it’s tough. I think the regular ones I flaunt in pitches are my big Perdition’s mouth cover and I have a few new pieces of World of Warcraft fan art that I got a lot out of on a personal improvement level. There’s also an image I did of a skeleton warrior that I did a long time ago that seems to have held its own quite well in my fickle favor! 4. How long does it take you to create your images? It’s tough to work out the exact length of a piece of work. There’s the back and forth between designer and artist, occasional revisions etc. Also becuase you work across several projects at once, sometimes you can be working on three different images in one day. I try to work out an image timescale by size versus cost. For example a piece of card art is likely going to be about a quarter of the price of some box art. I’d usually schedule a solid week of work for a box cover, and around a half a day to a day for a piece of card art. That’s based on the idea that it would be the only thing I was working on, and that I had the designer on speed-dial for immediate feedback. The reason why an art contract often has such a long deadline is the communication not the actual painting hours. 5. Where can we find talented board game artists like you online? If you’re searching though, don’t stop there. From my experience, having only just properly looked at Deviant Art (I’ve been on there about 8 years, and only just realized there are groups…) there’s lots of talent that can be found all over. There’s always the fantastic The Noble Artist and you probably should start and end your search there, haha. 6. 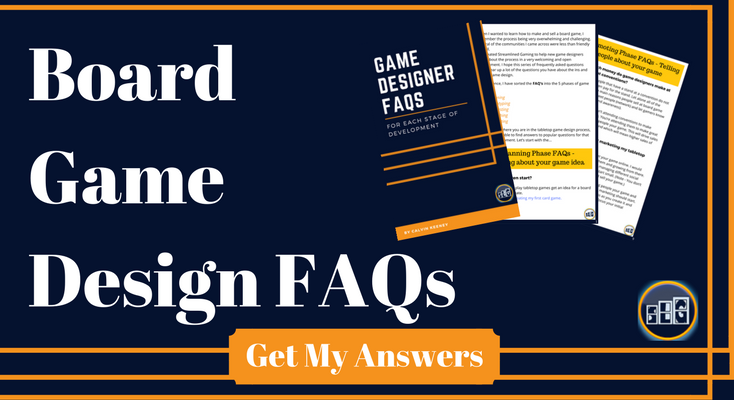 What makes it easier for you to better understand the world that a game designer is trying to create? You’re the designer, you know the game inside out. Assume I know absolutely nothing about the project and you’re on track. If you want your game to be both unique, and like the game you have had in your head, then you need to be as descriptive as possible. Synopsis, game mechanics, likes and dislikes in style all help to shape what you need. If you can make a good design document, it really helps. Also go to google images and just throw me links of stuff you like. It helps for artists to get on the same page if they can get a visual of what’s in your mind. I love getting rough sketches too. Stick men work as well as masterpieces so don’t be afraid to get your pencil sharpener out! 7. What is a common question that you get from board game designers wanting art for their self-published games? 1. I get a lot of inquiries from designers who ask if I will work on the basis that I’ll get paid in total or in part after a crowdfunding campaign (Kickstarter or similar). Before I go into a whole load of negative sounding rhetoric, if I was a millionaire who didn’t have to pay the mortgage or buy food for the family, I’d be all over more projects just to get creative. However as a freelancer it’s all a hand to mouth operation so unfortunately it’s just not worth the risk for a combination of reasons. Firstly Kickstarter is becoming a more competitive place. The chances of a game succeeding without the proper planning are diminishing against more established or organized designers. Secondly, if you don’t have the confidence in your project to make an investment yourself, I get cold feet pretty quickly. I’ve started lots of well-meaning projects with both friends and strangers that start off well, you both pour hours in then one party wanes in interest. Yes! I love games, I have a pretty healthy board game collection, Steam account and book of game design scribbles I enjoy adding to. I think it’s super important to play games to get subjected to new artwork and see how mechanics influence the design. Plus, I love playing. I tend to get a lot of solo games now so I can squeeze them in without having to arrange a play-date. 3. I get asked if I use photos sometimes. For the most part I don’t use them. There’s nothing wrong with using and manipulating photos as long as you have the rights to them, but primarily I’m an illustrative artist who paints digitally. Because my work is original, it gives it a style I feel is pretty unique, as it all comes from me. Always make sure that if an artist does use photos you know the original source, and it’s a reputable stock site or the artists own photography. I’ve watched a few videos recently about licensing and you can get stung pretty badly if you’re not diligent. The last thing you want is to get a cease and desist or worse when you’ve just paid out to have your game manufactured. 8. How can game designers make your life easier? I mentioned earlier about getting on the same page in terms of style, but a decent art list is imperative to getting a quote to start with, with information on sizes and content is great. “#1 10 card art pieces- 2 in x 1.5 in, full colour each using the same template (would also like this designed, see below). With a monster chest up in each, simple nature background for each. This way we don’t have to go back and forth with questions. The more professional you can be, the more excited we are to work with you as it shows you’re serious. We want the product to succeed as much as you do; it not only means more work for us (stretch goals, expansions etc) but also great success stories for our portfolio to pitch to new clients. Also be as communicative as you can, it’s great when you are both excited about the project, it’s a really conducive environment! Nothing stifles a good creative momentum like not hearing back for a week! 9. What are several of your favorite things about being a board game artist? I love the process of world-building. It’s really exciting to build visual lore around something that has been a vacuum in the designer’s head. Also, I love being a part of an industry that I spend a good portion of my disposable income on. It’s a small world once you’re in the industry. You end up meeting some people you have loads of respect for because you’ve had hours of enjoyment from playing their designs. Finally I love playing a game I have had a part in, and gleefully pointing out to my friends my artwork until I can see them frowning with frustration. 10. What are several things you don’t like about being a board game artist? Pitching and keeping up on my portfolio takes a lot of time which I’d rather spend actually painting something cool! I also have a love hate relationship with my personal progression. Although I love the fact I’m in my dream job, and can visually see improvement over the years I add to my career, I also have a pent up feeling of “I’m never going to get to where I want to”. It’s like a mixture of horrific anxiety mixed with elated excitement. I love the desire I constantly have to “get back at it” when I’m not working, but it can get a little all-consuming! More of Jamie’s work can be found on his website along with Industry interviews, tips and tutorials and his contact details for commissioning work. If you would like to show your support and stay informed of Jamie’s work in progress, then give his Facebook page a like.